Family cycle touring is awesome! This post may contain affiliate links. This means that if you follow a link from this blog and purchase something, I may make a small commission. Please rest assured that I only recommend products I use and love or wish I could be using. If you’ve been reading the blog for any length of time, you know we’re big fans of family cycle touring. In my humble opinion, it’s an awesome way to travel with kids. It’s not only a healthy, physically active, and environmentally-friendly way to travel; it’s a great way to really savour everything you see on a trip. When we did our cycle tour from Kingston to London, Ontario, we saw some awesome things we’d never otherwise have seen—such as some pretty amazing playgrounds that we never knew existed, because you don’t pass them by when you’re travelling at 100+ km/hr on the highway. We also discovered small shops with super friendly owners, a nice little place to sleep in Wellington, and so much more. Travelling with kids by bike is also great because if they get tired or antsy, it’s easy enough to park the bikes and find something to do. It’s not so easy to get off your vehicle when you’re in the middle of traffic near Toronto, or if you’re riding the train. Travelling by bike gives you freedom you don’t have with other kinds of transportation. If you’re travelling solo, you can have all kinds of fancy equipment, but really, a simple bike is good enough. We’ve hosted at least one cyclist who just rode his regular bike and carried a few things on it, and he was travelling pretty far (Toronto to New York City, I think? It’s been a while). When you have kids, though, you do need some more equipment, particularly if your kids are young. After all, if you’re taking a baby or toddler with you, chances are, they won’t be pedalling (or at least not for long distances). You’ll need to figure out a way to carry the kiddos. Family touring bikes can make your bike touring so much fun and more convenient, but there are other options as well. During our tour, we used a tandem bike for my husband and oldest daughter (6 at the time),and they pulled a Chariot (now Thule) trailer with all our camping gear. I rode my regular bicycle, and pulled a double WeeHoo in-line trailer. My son (4 at the time) sat in the front seat, which had pedals, and my daughter (then 2), sat in the back seat that had a little platform for her feet. This set up was good enough, but I wouldn’t use it again for a couple of reasons. One, my son and daughter have outgrown the WeeHoo trailer. Two, although WeeHoo makes awesome trailers, in my personal opinion, the particular one we had is better for commuting than touring. Pulling the WeeHoo trailer behind my bike made our set-up very long and therefore, a little unstable. When we were riding, it was fine enough, but when we stopped, it was a little harder, and we did fall over a couple of times. No one was hurt, though. We do love our Bike Friday, the tandem touring bike. If I were to be the one doing most of the riding on it, I’d need a much bigger seat, though. The seat it comes with does not accommodate my large Brazilian behind. For our next trip, we’re actually going to be taking the RV instead of full-time cycle touring. However, we’ll be bringing our bikes, parking the RV, and doing most of the actual touring on the bikes. The RV will just take us to our next destination, and we won’t be pulling a vehicle. We have a big trip plan in the works (stay tuned), and this time around we’ll bring our tandem bike, my hybrid, probably Dan’s road bike, and the kids’ bikes. We’ll do that to save some money, so we can spend it on other trip things, but we can still dream. Here are some awesome family touring bikes that we’d love to try out someday. We’ve had our eye on these bikes for a while, but they haven’t been within our budget yet. One day… one day, I’ll make them fit in that budget. Circ Cycles specializes in touring bikes, and offers several options for family touring bikes. The one I’d get if I could is either the Morpheus with young child and toddler seating, or the Helios with 2 children seating. The Morpheus has a regular seat for the parent, a reclined seat in front for a young child (and it can be adjusted for an adult to ride as well), and you can put a toddler seat in the back. It looks like an amazing bike, and I’d love to own one some day. The Helios can be outfitted wit the “triplet kit,” which allows the adult to control the bike while two young children can sit in the back and still pedal. Both models can also be oufitted with a baby seat! Although I’ve been dreaming about a Morpheus or Helios bike for a while, there are several other options on the market as well. Here are some of them. The Bike Friday Tandem Bike is the family touring bike we own. It works very well, and the neat part is that both the front and the back seats are fully adjustable, which means that though there’s a pretty significant height difference between my husband and me, either of us can seat in the front, and the same’s true for the back seat. My 4-year-old is still not tall enough to reach the pedals with the seat in the lowest setting, so if you have a younger child, you’d want to add a child seat to this rig. Personally, I’d prefer if the handlebars on this bike could go much higher than they do. I like to sit upright when I ride. I know that’s not the most aerodynamic way to do things, but when I’m touring, I’m not worried about speed. To accommodate my back pain, sitting upright works much better for me. Also, as I mentioned before, I’d like to change the seat to be bigger, but that’s the case with pretty much any bike I’ve ever ridden. I purchased a bigger seat for my hybrid bicycle, and I’ll most likely do the same for any other bike I purchase. If you have kids, you know that there are only 3 certainties in life: death, taxes, and kids outgrowing stuff. That’s where Santana travel tandems come in. These bikes are made with couplers, so that they’re easily adjustable depending on how many people are riding them. That means you could start with a 5-person tandem bike, like the Pedouin family did, and then go down to a 4, 3, or 2 seater as the kids outgrow riding with you and wanting their own bikes. I’m slightly tempted to invest in a quint… but as it costs more than any of our cars ever did… I’ll need to think about it. I love the name of these bikes, because it’s a super clever pun. We do cause a bit of a commotion whenever we ride our “bike train”—That’s when we attach a trail-a-bike to our Bike Friday Tandem, and the Chariot trailer to the trail-a-bike. We often ride around town in this get-up, and it always catches people’s eyes as we pass by—most family bikes cause a bit of a (good) commotion as you ride. And experiencing co-motion on tandems with your kiddos is super fun, too. Co-Motion Cycles offers several options for family tandems. The most the bikes seat seems to be 3, so if you have a family of 4 or more, you’d need more than one bike, which isn’t super budget-friendly, but these bikes could work if you have older kids. You could also probably easily attach a child seat to one of the models as well. These are just some of the awesome options for family touring bikes out there. 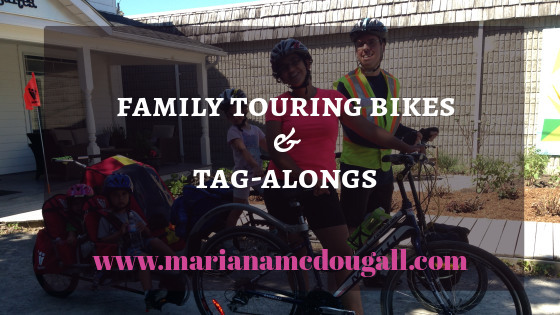 For more in-depth information on choosing a bike for your family touring needs, check out this awesome post by the Family Adventure Project. This is an awesome blog worth following for anyone who wants to be more adventurous with their kids. What other bicycles do you love? Let me know in the comments! Next Next post: Is Your Homeschooled Child Falling Behind?